Commissioned by the City of Geneva. Production DRAMA/Sillages, in coproduction with Césaré (National Centre for Musical Creation), Reims. Three short films by Georges Méliès interspersed with four little films, with accompanying music for seven musicians, electronics and conductor. The show is organized around three films combining science-fiction and magic. Three short films by Georges Méliès interspersed with four little films. ‘The show is organised round three films mixing science fiction and extravaganza : Le Voyage dans la lune, Voyage à travers l’impossible (voyage to the centre of the sun) and Le Royaume de fées. The first two films complement one another symmetrically : the first voyage is made left to right, the second right to left. Between these two large interstellar voyages, we find ourselves with a fanciful fairy tale brimming with imagination. These long short features (lasting 12, 16 and 20 minutes) are punctuated by very short films (2-3 minutes) in which we see Méliès direct himself, giving free rein to the magic of special effects : multiple exposures, matte shots, frame-by-frame shooting… They attest to the discovery of the new technical means permitted by cinema at its birth. The composition of the music remains closely linked to the image and the cinema discourse while maintaining its own grammar and freedom. It follows the plot, fading or accentuating with musical gestures that are sometimes exuberant, in keeping with the acting, which evokes mime more than theatrical declamation of the period. Here, mixing instrumental sounds and those produced by electronic synthesis or transformation takes on its full sense, echoing the approach of this enthusiast of disco- very, innovation and new technologies. My idea was to write ‘light’, playful music that plays between real sound and transformed sound, motifs, rhythm and colours. It endeavours to be close to Méliès’s art, above all his intentionality, open-mindedness and humour, taking the imaginary, wonder and invention as sources of inspiration. One could establish a progression – a historic lineage – as concerns my relation to the image and handling of musical time. I have always adhered to Norman McLaren’s thought that ‘it is of little importance what moves; what is important is how it moves’. The Canadian filmmaker considered himself the spiritual son of Méliès, to whom we owe the remark : ‘The question is to understand what cinema must be… especially movement’. 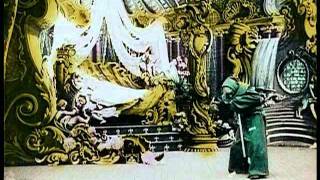 Méliès, like the Symbolists, felt that art had value only if based on magic and music. He conceived the film as a means of personal expression, which gave me the free- dom to do as much with the musical composition for this show. This entry was posted in Music for silent movie, Electronic, Large ensemble and tagged viola, clarinet, Double Bass, flute, percussion, piano, violin by carlos. Bookmark the permalink.